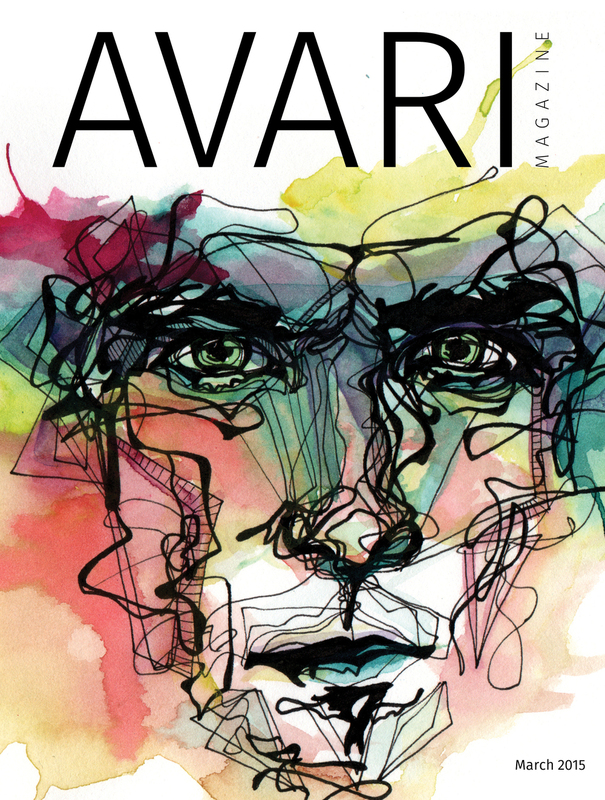 A few of my art pieces were chosen to be featured (one of which was chosen for he cover) in the March edition of Avari Magazine. You can also click here to download your own copy. or simply scroll to see the pages that contain my work. Update!! News and Upcoming Events! I just wanted to give you some updates on what I am up to and also share with you where you can find me out and about this Spring and Summer. I am very excited to announce that I have been chosen to be a feature in a brand new online fashion magazine called Avari Magazine. They found me through my online shop and contacted me to show one of my drip portrait faces but then discovered more of my art and decided to show 4 pieces, one of which will be their March cover. The magazine will be released sometime next week. I have filled up my Spring and Summer calendar. My art will be appearing at other locations from April 1st through the end of August with art walk receptions and events through out. Hope to see you at one of them. Email me if you need more info. Hi everyone. It's me, Whitney. 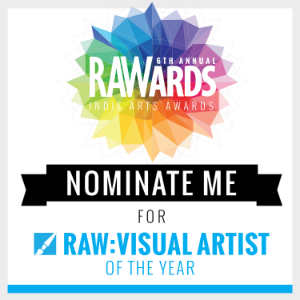 Over the course of the competition, RAW artists engage in online public voting (this is where you come in), city-based local judging, and then final judgments by the official RAWards judge panel, which consists of a mix of creative celebrities and well-known industry professionals in each RAW category. I need your help, ladies and gents! You have a chance to vote once per day over the next 7 days. Every vote counts. (Click on the image above to register and vote). I will be posting brand new art and videos everyday this week to my Facebook art page and Instagram to help remind you. I will even go as far as sending a text or phone call if you would like. Let me know. I am m more than happy to harass..I mean notify you if you elect to let me. Thanks for stopping by!! And THANK YOU for voting! 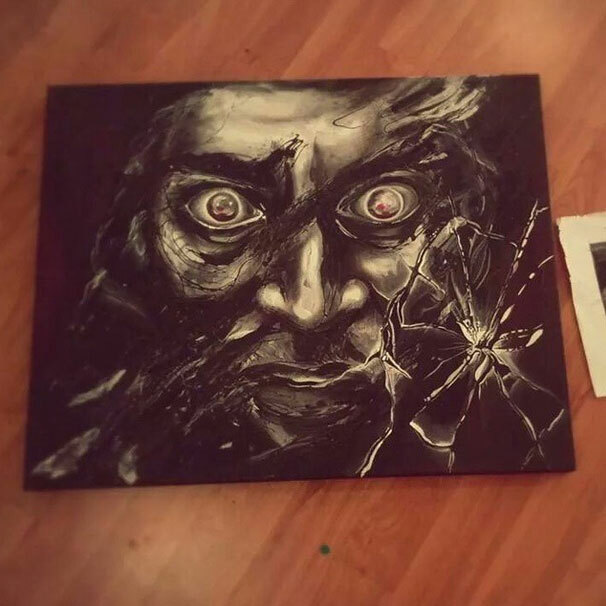 I recently sold one of my favorite paintings thus far." The Jelly Dance". It was sold to a good friend of mine in Portland. Oregon. I don't know about you but I am NOT a fan of large shipping fees. Other artist friends have told me about being quoted hundreds of dollars to package and ship art out of state. I decided to take matters into my own hands. Here is how I did it. I bought a few moving boxes from a local U-Haul. It is cheaper to order cardboard panels online through ULINE if you have the needs to order in bulk (the minimum may be 25-50 pieces). 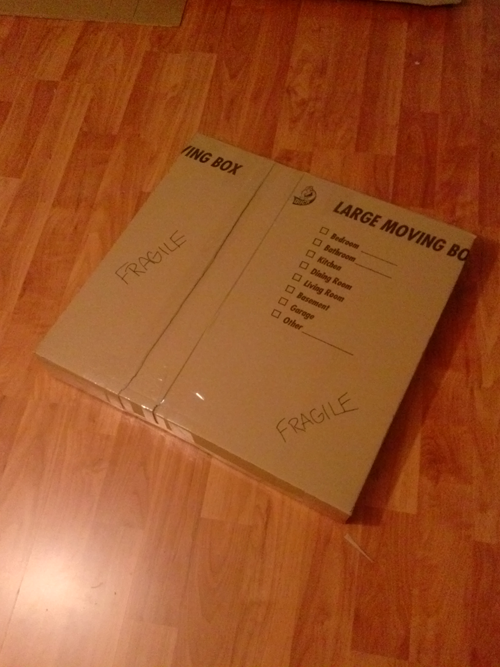 I personally don't have a lot of room and I really don't know how much I'll end up shipping in the future so I started with three boxes from Uhaul at $3.95 each. Make sure that it is big enough for your canvas. I also bought a 15 foot roll of medium sized bubble wrap that was about 12 inches wide. This was $6. I know this was bogus but hey I'm making mistakes for you to learn from. Here we go! I started off by cutting the box open along the seem where it was originally adhered. I then bubble wrapped the 24" by 24" piece and set it down on the cardboard panel. It is important to wrap your piece first so you can factor in the extra padding to your measurements. I wanted to see if I could use an already bent edge as a starting point and I DID!!! This made my life a lot easier. (See the yellow line below.) I made all of my guidelines by measuring from that point. Here is what my guides looked like for scoring. 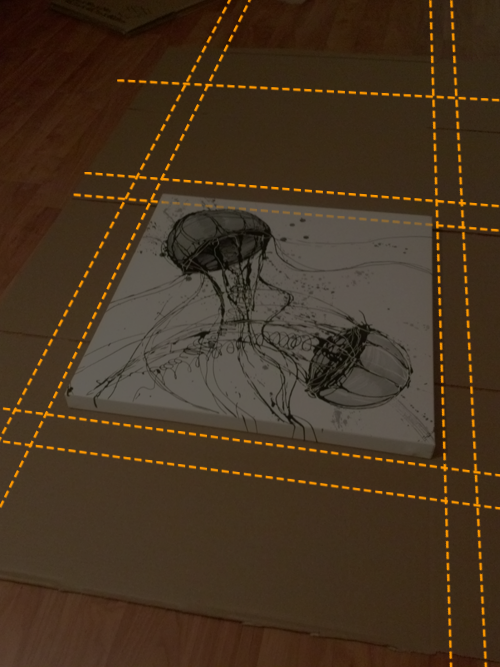 (Pretend that the canvas is wrapped in bubble wrap) I used a ruler and marked all of my lines first then I went back and scored all of the lines VERY lightly with one edge of my scissors. An exacto blade would work as well. And now...I'll break it down a bit. I started by measuring out one inch on all sides of the canvas. This insured room that I could surround the edges with crumpled-up newspaper for extra padding and protection. From those guides, I went out another 3 inches to make my box sides (again leaving room for extra padding). Time to measure out the box top. These should be the same measurements as the area under your canvas. Or if you are lazy like me just fold the flap over and turn it upside down and use your pencil to mark the edge. When you have all of the guides marked and scored like the image below, you can go ahead and cut off the extra cardboard. The box should fold easily. (Look at that! It's magically bubble wrapped again!) Sometimes you have to press on the score with your finger to make it bend. Note: You may want to give some of your box flaps angled edges to make it easier to fold up and tape but the rest is up to you. MAKE YOUR LIFE EASIER and create a template once you have finalized your box for future use! In my case, I traced an outline of this directly onto another sheet of cardboard. Surround the edges with bubble-wrap, newspapers, tissue paper or whatever you have on hand then TAPE IT ALL UP! The finished product!! 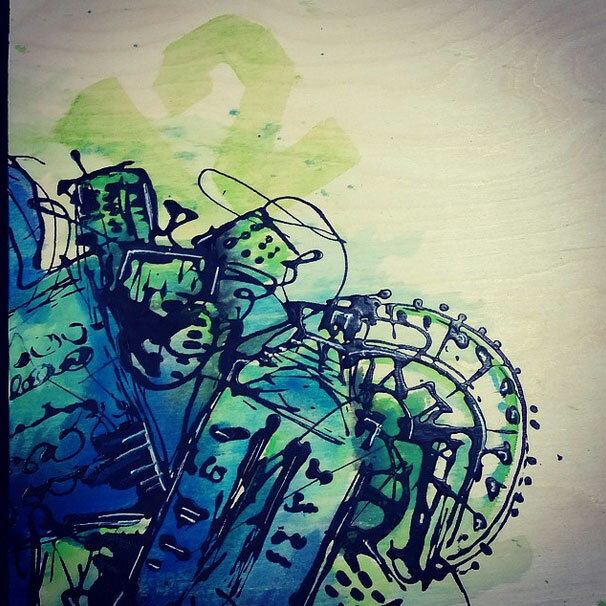 A beautiful custom made box! The morning started off by bringing my three pieces to the venue, El Corazon in Seattle. Hanging time was noon til 5pm. I wanted to get a good spot so I showed up early. A/NT Gallery is holding a special exhibit this February -- "Eros: Expression of Desire," featuring art that celebrates adult relationships encompassing the diversity of love, lust and eroticism. Opening Reception is Saturday Night, February 1, 2014, from 6pm - 9pm. I entered a piece from my Ink and Watercolor collection called "Longing". I was really excited about this piece. 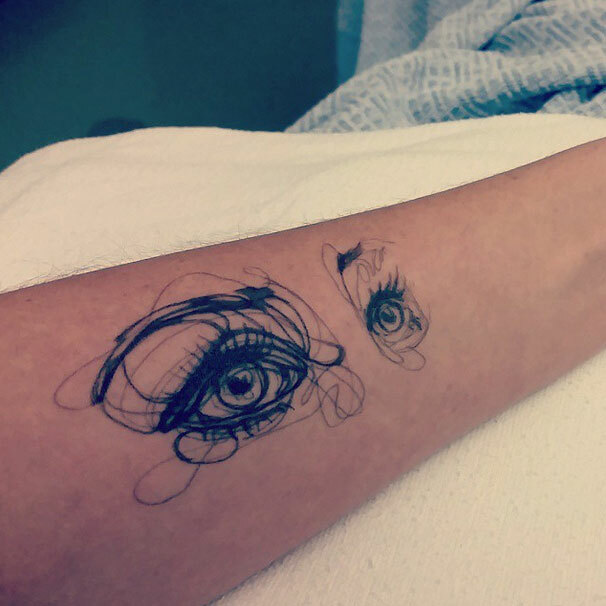 It was created a year ago from a sketch that I had done in ink. It is one of my favorites. I was able to buy a white frame and customize it so that I could float the image the way I wanted to (with the help from my framer - Mom). Check out my framing job in the images below. The gallery was in a great three level building with white walls and exposed brick. The show had organized drop off times so I left my artwork with the gallery for them to hang a week before opening. During the opening reception they had live music and wine and had the viewers vote on their favorite pieces which was then tallied up on Valentine's day where they had announced that a friend of mine A.O. Hamer had one first prize for her piece "Reincarnation of Venus". A happy win for sure! Here are a few photos from that night. Hey Everybody, I'm just thinking back on last nights event. It was my first time showing at a real gallery!